BioShock is a game I liked quite a bit. It's fun and smart on an artistic level, but I find they really dropped the ball on one thing. BioShock tried to make the players make meaningful choices (as discussed in the last post), but it failed. In the game, each time you find a Little Sister, you must choose between setting her free or killing her. The story explains that this choice is a moral one: graciously set the Little Sisters free and receive a minimal reward, or kill them to selfishly maximize your reward. This is what the scenario tells you, but the game itself tells you differently. The gamer will quickly notice that the difference in rewards is minimal (and even when choosing to save the Little Sisters, the player receives a compensation later in the game, making the difference between choices even smaller). The decision has a very minimal effect on the player. Is it a meaningful choice? There aren't any real consequences in the game world, so I would have to say no. This creates a sort of conflict between what the context is telling you (saving or killing Little Sisters is an important moral decision) and what the game is telling you (do what you want, it doesn't really matter anyway). Before reading about dissonance in video games in Jesse Schell's The Art of Game Design, I never noticed it in games, but I see it everywhere now. A lot of popular modern games are highly dissonant, and now that I'm aware of it, it removes part of their appeal. Shortly after tuning in to this dissonance, I played through Assassin's Creed III. 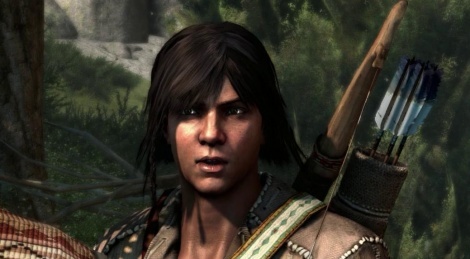 The protagonist, Connor (or Ratonhnhaké:ton), is a Mohawk/British métis who grew up in his tribe's village in the woods. He is stubborn and determined, in tune with nature and good-willed. One of the side quests in the game involves participating in a brawling tournament. Fighting unarmed, I socked my way through the competition, but I couldn't help but notice that a few of the knock-out animations were actually lethal. After snapping an opponent's neck in-game, he would get right back up in the following cutscene. Hm. I had surely seen these animations earlier in the game, but they hadn't stood out since they weren't so dissonant in context. Most enemies in the game are, well, not really villains, just British or Patriot troops that you piss off somehow. I tried to play by Connor's personality and just beat them up to get them off my back, but once again, Connor snapped a few necks. That isn't the end of the world, but later the dissonance really kicked in. In a certain cutscene, Connor yells at someone for unnecessarily killing a single guard: "You didn't have to kill him! ", or something along those lines. Shortly afterwards, I, as Connor, was unnecessarily slaughtering a squad of American troops that wanted to kill me because I had bumped into two of them - right after liberating a fort from British control for them. Even if I had chosen the unarmed option, Connor still kills. The only real non-lethal option is running away, which takes time and is risky since more troops can arrive. Even when trying, it's sometimes hard to play according to Connor's character. Once again, the context is telling me one thing (you shouldn't unnecessarily kill guards, it's wrong!) and the game another (you are almost forced to kill a bunch of guards). This dissonance bugged me and kind of ruined the character development the writers had intended. How can you take serious a game that is so unintentionally contradictory? It just doesn't hold up very well. The game design should support the themes, not contradict them. Hopefully designers will start focusing a bit more on thematic unity to avoid embarrassing dissonance. I think it's an important factor of a game experience that needs to be taken seriously.